With unmistakable clarity balanced by just enough shine to evoke brilliance, the distinct profile of the Asscher-cut diamond truly makes a statement all on its own. The historic resplendence of the Asscher-cut diamond and its namesake company are internationally renowned for their impeccable diamonds and ties to royalty. The Asscher-cut diamond was named after its creator Joseph Asscher of the Amsterdam-based diamond company, the Asscher Diamond Company. Asscher diamonds are characterized by a square shape with cropped corners that give them an almost octagonal appearance. The width of the corners may vary from diamond to diamond. What’s more, once mounted onto a four-prong setting, the Asscher-cut may take on a completely square appearance. Asscher-cut diamonds feature a deep pavilion, high crown, and small table which give the cut its captivating Hall of Mirrors effect. Royal Asscher-cut: features 74 facets and wide corners and is classified as octagonal. Classic Asscher-cut: features 58 facets and an exact 1.00 length-to-width ratio, and is classified as square in shape. Modern Asscher-cut: is most similar to a square emerald-cut, features 58 facets and has a more square shape. The shape is uniquely versatile with a stunning flair that suits both modern and vintage styles. Antique jewelry collectors and wearers alike love this shape for its Art Deco history and “Roaring Twenties” appeal. What is a Royal Asscher-Cut Diamond? While the Classic and Modern Asscher cuts are comprised of 58 facets, the Royal Asscher-cut boasts 74 facets and a higher crown. Both cuts were created by the Royal Asscher Company, but only the Royal Asscher-cut was ever patented. What is the Difference Between an Asscher-Cut and an Emerald-Cut? The Asscher-cut is the brightest of the step-cut diamonds, giving off an alluring “Hall of Mirrors” effect similar to that of the emerald-cut diamond. The Asscher-cut, however, typically features larger step-facets, a higher crown, and a smaller table. These differences make the Asscher-cut more brilliant in comparison to the emerald-cut. Perhaps the most notable difference between these two diamond cuts is their shape. While the emerald-cut is typically rectangular, the Asscher-cut diamond is more square. Both shapes have cropped corners, but due to the square nature of an Asscher-cut diamond, the cropped corners give the cut a more octagonal shape that is considered one-of-a-kind in the diamond industry. There is, however, some debate in the industry regarding the overlap between a Classic Asscher-cut and Square Emerald shape. First produced in 1902 by the Asscher Brothers in Holland, the Asscher-cut diamond initially peaked in popularity around the 1920s. In the early 2000s, one hundred years after its creation, the Asscher-cut’s popularity surged again thanks in part to modern modifications that gave the shape additional shine. The creator of the Asscher-cut diamond, Joseph Asscher of the same-named diamond company, eventually rose to fame for his expertise in cutting the famous 3,106-carat Cullinan Diamond for the English crown jewels. The Asscher family was later given a royal title by Her Majesty Queen Juliana of Holland in 1980 for their role in shaping the diamond industry. In recent years, Asscher-cut diamonds have made a steady comeback due to Edward Asscher, great-grandson of the legendary Joseph Asscher. His innovative research and development modified the shape to dramatically augment its brilliance. To this day, the Asscher-cut diamond maintains its iconic popularity in both stunning new jewelry and envious antique pieces. At Zales, we entrust the grading of our diamonds to the professionals at GS Laboratories (GSL). First incorporated in 1985, GSL provides unbiased and skillful diamond grading services. Each Zales diamond is examined carefully by a GSL diamond expert in controlled laboratory lighting and viewing conditions. This ensures accurate diamond grading results. The GSL laboratory notes any inclusions within each Asscher-cut diamond as clarity concerns. GSL grades diamond clarity as one of the following six grades – Flawless, Internally Flawless, Very Very Small Inclusions, Very Small Inclusions, Small Inclusions, or Imperfect. With Asscher-cut diamonds, inclusions are often more noticeable to the naked human eye. This is because the large, flat table of an Asscher-cut diamond serves as an unobstructed window into the middle of the diamond. As a result, any inclusions in the center are easy to see. For this reason, we recommend opting for a higher clarity grade when shopping for Asscher-cut diamonds. For grading the color of diamonds, a color grading system is in place that begins with a D grade (colorless) and continues alphabetically with increasing levels of color up to a Z grade. For grading the color of diamonds, GSL uses a set of master stones that have pre-determined and tested color grades. Comparing Asscher-cut diamonds to these master stones allows experts to accurately grade their color. The size of a given Asscher-cut heavily influences how the human eye perceives the diamond’s color. 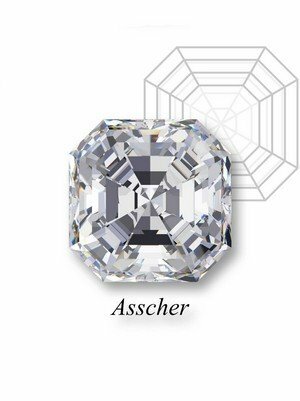 Small differences in each Asscher-cut diamond’s color may not be noticeable but may account for a significant jump in the price of the diamond. When browsing and evaluating larger-sized Asscher diamonds (especially those over 1.50 carats), the large facets may show body color especially well. We strongly recommend that you visually examine each Asscher diamond prior to purchase to ensure you are 100% happy with its color. Another key: keep your envisioned setting in mind. The material and color of your setting can affect the appearance of your diamond’s color. The GSL Laboratory determines a diamond’s length-to-width ratio by dividing the length of the Asscher-cut diamond by its width. The resulting ratio determines how proportionate the diamond is to its intended shape. As with all diamond shapes, the preferred length-to-width ratio will be a matter of personal taste and style. However, a classic Asscher-cut diamond is a perfect square with a length-to-width ratio of 1.00. This cut can be found in slightly rectangular shapes as well. As a general rule of thumb, any ratio of 1.05 or less will appear square to the human eye. When shopping for your perfect diamond, we recommend examining a variety of Asscher-cut diamonds first to help you decide your preferred look. The Asscher-cut diamond is the brightest of the step-cut diamonds, with large facets that give the shape a unique look and feel. Similar to the emerald-cut diamond, the Asscher-cut features cropped corners on a square shape. The Asscher-cut’s octagonal appearance has surged in popularity in recent years for both new diamonds and in vintage jewelry. If the dynamic shine, royal reputation and “Roaring Twenties” flair of an Asscher-cut diamond calls to you, discover Zales selection of Asscher-cut diamonds today.